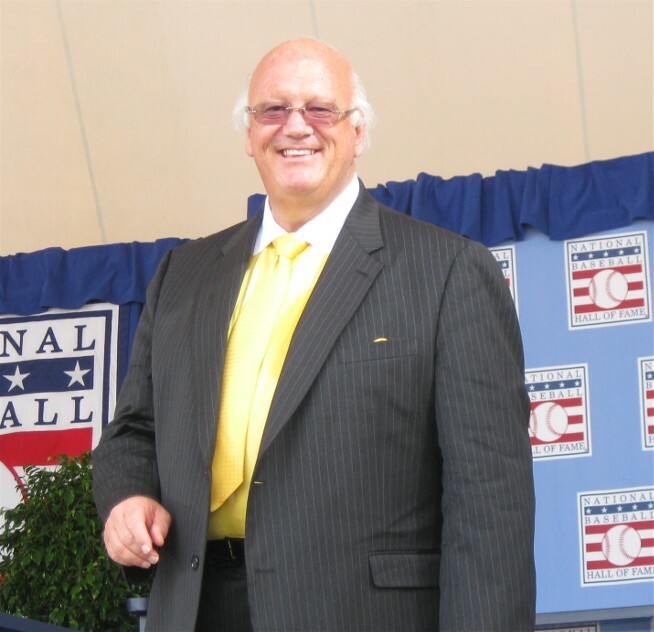 The following is the speech given by ASA Board member Jon Miller upon receiving the Ford C. Frick Award from the Baseball Hall of Fame in Cooperstown, NY, on July 25, 2010. ASA President Lou Schwartz was also on hand to take part in the festivities and show support for Miller. Thank you, Ms. Clark and Jeff Idelson and my partner, Joe Morgan. And thank you for being here today. I'm still kind of in shock. I don't know how this possibly could have happened. Really, the seminal point of my life occurred at Candlestick Park, Giants game in 1962. My dad and my godfather took me to my first Giants game. They already told me of Russ Hodges and Lon Simmons, baseball and radio, and I was a big fan that way, and I was still such a fan, still have Russ and Lon, that that first game we sat in the upper deck on the first base side of the Stick. And I could see into the broadcast booths, and I spent more time with binoculars looking at Russ and Ron while the game was being played and the visiting broadcasters than even the players on the field. In fact, this is when, the moment that changed my life occurred. I'm looking into that visiting broadcast booth and right in the middle of an inning there's a batterat the plate and that broadcaster says, "There's a curve ball, low and outside, Ball 2." And then he grabbed a big handful of, I thought it was french fries, and he jammed all these french fries into his mouth and he's chewing on those fries, and while he's still chewing the next pitch comes in and he says, without missing a beat, "There's a fast ball outside, Ball 3." Then he grabbed a cup full of whatever. He took a big pull on that cup. And as a ten year old I sat there and said, "That is the life for me." Now, it's not that easy for anybody in baseball, player, broadcaster, to be a member of that family because dad is never home, and I know all of my kids had some interesting things that occurred in their lives, a little bit different, maybe, than a lot of people's lives. My daughter, Emily, once, my daughter, Hollie, they came to Spring Training with me once in Miami when I was with the Baltimore Orioles. And my daughter, Emily, was not quite three years old. And I'm in the middle of an inning, my partner on the broadcast had taken a walk, gotten a hot dog, I don't know where he was. It was a three ball, two strike count. And my little daughter, Emily, tugged at my Hawaiian shirt. And so, I turned and said, "What is it, Em?" She said, "Dad, I have to go potty?" "Can you hold it for just a minute, sweetheart?" "No, I have to go bad." So, the pitch came in and it was fouled away. "Fouled a way. Still three and two." And I jumped up, grabbed her, ran her down to the bathroom. Put her in a stall. I said, "Okay. Now, don't touch anything and don't leave. I'll be right back." So, I ran back to the booth and the runner is now at first base. But I don't know how he got there. It was a three ball - two strike count when I left. So, I turned to the engineer, and he's sitting there reading a Robert Parker novel, and I said, "Hey, how did he get on first base?" He says, "Oh, there's a guy on first?" So, I ran down the hall until I found a couple of sportswriters, and I said, "How did that guy get on first?" He said, "Oh, he walked." I ran back into the booth and said, "Outside, Ball 4." Now, here's whoever. "There's Ball 1, and a strike, Ball 2, oh, Strike 2. He's working very quickly. Here is the pitch. Fouled away. Still 2 and 2." Then it hit me. Oh, Emily. Turned the mike off, ran down, grabbed Emily, washed her hands, got her all washed up. And I had this bad feeling this guy was also going to be on base and this might just go on all night long. Fortunately, he was still up, end of would-be disaster. Now, I want to just introduce my family. They're here, they've taken time from their busy lives. I'm so proud of them. Maybe you can say hello to them. So, first off, my beautiful wife, Janine. My daughters, Michelle -- Michelle, Emily, Alex and my daughter, Hollie, with her husband, Paul Gallagher. Maybe a lot of you didn't realize that there's a lot more history to being a broadcaster than even you know. I once found a passage in the Psalms, a Biblical passage, and the tradition of this business goes back to Biblical times. The Psalm says "Lord, I am but a wayfarer before you, a pilgrim like my fathers, a wandering play-by-play poet." That was my interpretation of that passage. "Cast not your gaze upon me, lest I perish from the face of the earth." And I'm reminded of that today because I'm a little bit overwhelmed with this honor, with all of these great baseballplayers here, gathered in one place, and I do feel particularly lucky and blessed that they gave me this award. I'm still having a hard time figuring it out. But there are a lot of people that gave me a lot of help and one of them was just about to head out on a European vacation planned a long time ago with his wife. My lawyer and his partner. They changed, they moved heaven and earthand moved the vacation back to tomorrow, and I hope he gets there in time. Please say hello to my lawyer and my great friend, Ron Shapiro. And also, Michael Moss. And A great friend for many years, an accountant. He helped me manage the tangled finances because I have no clue what I'm doing in that regard. But I called him and said, hey, they're giving me this awardat the Hall of Fame. He said, oh, congratulations. How much is that going to cost? Brian Woods. Thank you, Brian. Now, also in San Francisco, we have not only a great history of broadcasters with Rus Hodges, Lon Simmons, whom I grew up listening to, idolizing, right now two former players, who are great broadcasters, I'm a little sheepish being here today because does a better job than they. And I'm talking about Mike Krukow and Duane Kuiper. Mike Krukow, former Cub. 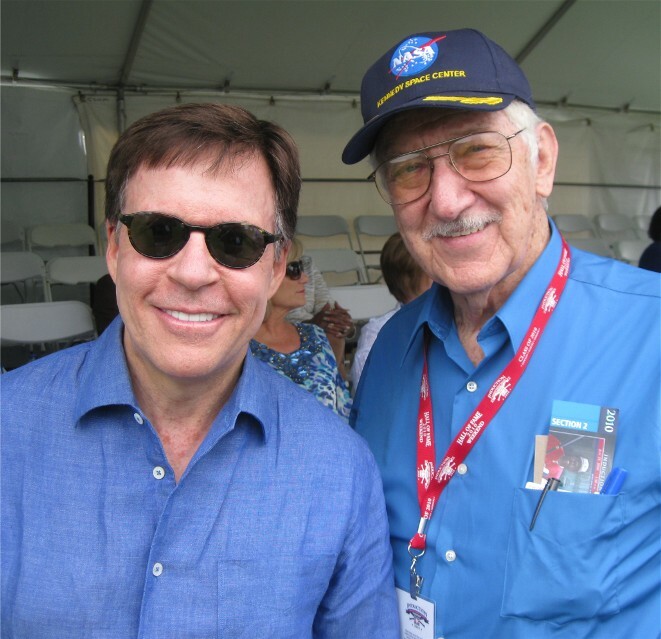 Also, the best young play-by-play man in the business, and I fully expect 30 years from now I'll tune into Giants games -- let's see 30 years, I probably may have been just retired, maybe the year before -- and he told the Giants, I have to be there with Jon, I want to be there. And they said well, who is going to broadcast the game? He said I don't care, get somebody. Here he is. Please say hello to Dave Fleming. I'm going to turn on that radio in 30 years, it will be, this is Dave Flemming, along with Tim Lincecum, Giants Baseball. Now, you know, I don't want to keep thanking people like they do at the Academy Awards and all that. But my dad did turn me on to the baseball on radio and said, hey, you may enjoy this. There's this guy Willie Mays, he's pretty good. And take a listen. So, of course, I love him, so, thanks, Dad. Also, Russ Hodges and Lon Simmons. Lon Simmons, who is semi-retired now, still involved with the Giants now, but he lives out in Maui. Lon called me when I got this award and he said to me congratulations. By the way, can you get me a phone number and a name up there in Cooperstown? I have a lot of people who are outraged about this and they want to see if they can get it overturned. Not many people have friends as close as that. Now, also, my first job as a Big League broadcaster in 1974, with the Oakland Athletics. They were the best team in baseball, the team with Reggie Jackson, Catfish Hunter, Vida Blue, Sal Bando, Joe Rudi, on down the list Rollie Fingers. What a ballclub. One of the great teams of all time and I think they're underappreciated. I think they don't get their just due. They had fired -- Charlie Finley, he had fired an outstanding broadcaster, Jim Woods. And they said, why did you fie Jim Woods, Charlie? He's so good. And Charlie said, well, he wasn't exciting enough when nothing was happening. So, I get hired and Monte Moore was the reason I got hired. He heard my tape, he says I never heard of this kid. I was 22 years old. I never heard of this guy, but the tape is damn good. And, so, he told Charlie, this is the guy we need to hire. So, now we go to Spring Training, we have the first broadcast and Monte is on he air, it's at Rendezvous Park in Mesa, Arizona. I'm thinking not exciting enough, when nothing is happening, so I start practicing a few things because I didn't want to screw is this job up. I'm thinking things like there's a one-hopper right to shortstop. Oh, baby. What are the odds? He could have hit that ball anywhere. It went to the shortstop. Is that incredible? Look at that popup. It's eight miles up in the air. Unbelievable. Anyway, Monte turned the mike off and says, what the hell are you doing? So, I tried to explain it to him. He says, oh, hold on, let me finish this inning. So, Monte finishes the inning, I explain it to him after the inning. He said that's just a bunch of bull. We hired you because you do a good job. Just go do that and be yourself. I don't want to hear any more of that baloney. And he was right. It was a great season. We got good write-ups in the press. Everyone seemed to enjoy it. And then just before the start of next Spring Training, and Charlie fired me. And I don't think, really, he even remembered that he hired me. I think he thought he was firing Jim Woods all over again. So, it goes. But I kind of rebounded a little bit with some other ballclubs. I went to Baltimore, which was a great thing for me. Got to know Earl Weaver. I got to learn a lot of things from a lot of people who are up on this stage today. And Earl, great Earl of Baltimore, I learned so many things from him. But one day he put on a suicide squeeze in Milwaukee and he had not had a sign for the squeeze. He hated the squeeze. So, we asked him, we said, Earl, I thought you said you didn't have a sign for the squeeze. And he says no, I don't have one. Well, how did you put the squeeze on? He said, I whistled over at Rip, Sr. out at third base, the coach. And he turned to me, I said, "Rip, Rip, squeeze, squeeze." I said, well, Molitor is playing third. He didn't hear that? Earl, well, I guess not. So, I asked Paul Molitor all these years later, last night, about that. And Molitor says well, Earl was also screaming about something and I'm sure I just blocked it out, like everything else he was screaming about. Sometimes the genius is in the small details, Earl. Also, a guy who was so good to me, I went and did Red Sox games for a time, Ken Coleman, he wanted into to come there. One f the most generous men that I ever worked with. It was like having my agent in the booth with me every day. He just was alwaystrying to make me look good. He wrote a diary of one of our seasons together, called "Diary of a Sportscaster." I just want to read you one of those passages, just to give you an idea of how close Ken and I were and what great guy he was. "Tuesday, May the 6th, 1982. After the game tonight in Seattle, John was a little bit down. So, we went out, drinking together. John didn't drink, butthis night he decided to have some beer. After his 27th beer, I sensed that he was still down a little bit. So, I got him into a friendly game of poker. I took him for $4000. I'm hoping that I can help John relax like this again real soon." Wow, what writing. Now, I used to kid Joe when he'd come up here for the Hall of Fame ceremonies every year and I would say to him, well, you're going up to there to baseball's Mt. Olympus to rub elbows with all of your fellow baseball immortals, the gods of the games. Maybe a little rye comment to Joe. And now I've been up here the last few days, and it turns out I wasn't joking after all. I walk into a room and look there, it's Zeus, Henry Aaron. Oh, look over there, it's Apollo, Willie Mays. Oh, my God, is that Whitey Ford? Oh, there is Mr. October, Reggie Jackson. Wow, Bob Feller, one of the gods of the game. So, I've been walking on air ever since I got into town. Again, I'm not sure how it happened, but I'm grateful to you all, I'm grateful for all of my family and friends that made the trip all the way here to Cooperstown. Let's get on with the real show here very soon. I want to congratulate all 9 of the inductees and Bill Madden of the Daily News. Richly deserved. And, hey, I'm a kid from Hayward. I just wanted a job where I could eat french fries while I was working. And now here I am today. So, thank you, very much. Thank you.